After taking the candy and we consume it, what do we do to its wrap? We throw it away. That's how Allah SWT puts sustenance for each of us. Rizq from Allah comes in a form of a package. It comes with its wrap. And what is the wrap? The wrap is the test for us. Our rizq from Allah brought by angel Mikail to us wrapped in tribulations and trials. If we will to accept the package, In Shaa Allah we'll get the rizq inside. 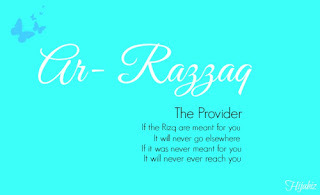 Accepting the package means accepting the wrap first, which is trials and tribulations, then accepting the rizq inside. At the time we feel grateful for the wrap, grateful for the test, that's the time we get our rizq.